This was one of my new year resolutions, I mean they’re not bad, but I notice them, and I want them to be perfect, so here it goes – braces at the age of 29. It’s been a well documented journey via my instastories, visiting various dentists around central and south west London trying to find the one that gives me that safe feeling. Yes I needed a safe feeling because I’m pretty emotional about my teeth, and people only understand that who have had some sort of tooth trauma. When I was younger I fell over and broke my front tooth, since then I’ve been super conscious about them and have hated the dentist touching them. That sheer panic of going to the dentist and hearing them say ‘Oh no, they’re all rubbish, I’m going to have to pull them all out’. I know that’s (hopefully) never going to happen, but it still terrifies me. So after going through the pain of train-tracks in my teens, which resulted in perfectly straight teeth, I then found that they started to move as I hit my mid 20’s. I mean, why did we not know then that we needed to add in the fixed brace afterwards so that they would never move again?! 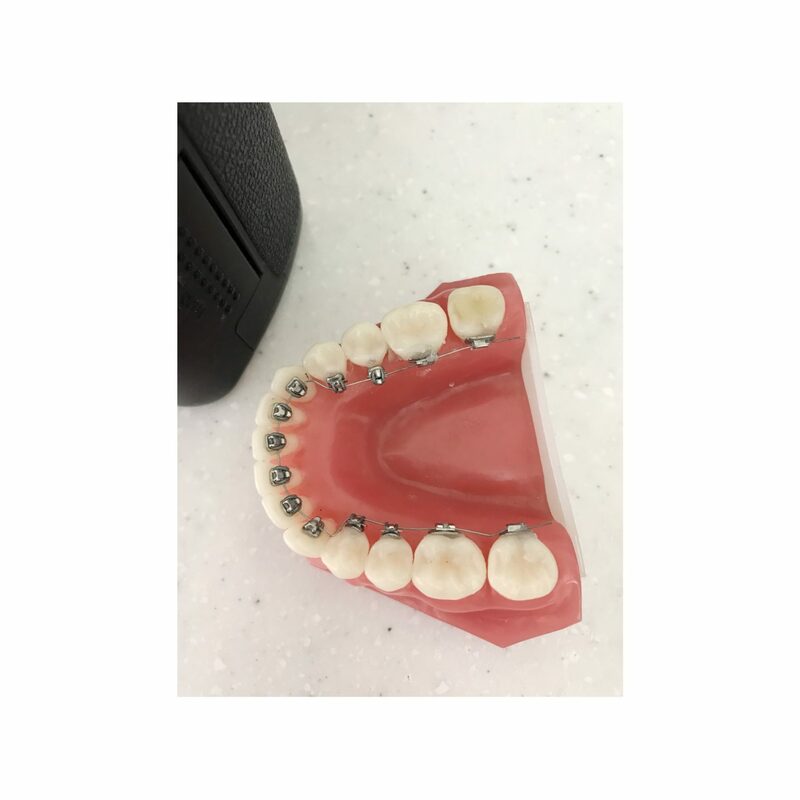 (A fixed brace is a super thin metal strip that’s on the inside side of your teeth, so not visible at all, but it prevents the teeth from moving and is there for life. After visiting many dentists around London, I’ve decided to go ahead with my treatment at The London Lingual Orthodontic Clinic. Yes they have incredible reviews, but it was honestly purely done to how comfortable they made me feel during my consultation. I’m a cryer, I cried three times during a hygienist appointment with them, and it has to be said that they were incredibly kind to me. The staff are super sympathetic and calming, and they took the time to give me a break and relax before making sure I was ok to carry on with the treatment. Dr Asif Chatoo, my new dentist is unbelievably calming. Him and all the staff stay professional while making you feel at complete ease. Dr Asif Chatoo talked through everything with me thoroughly during my consultation, so I knew exactly what all my options were. As the clinic I am going for my treatment with are an actual orthodontist clinic, Dr Asif want’s the teeth to be straight but healthy (hence the hygienist appointments.) So although I want them done for cosmetic reasons, Dr Asif is concerned about my bite, and whats to correct that aswel as straightening the teeth, otherwise they just run the risk of moving again as the jaw isn’t aligned. 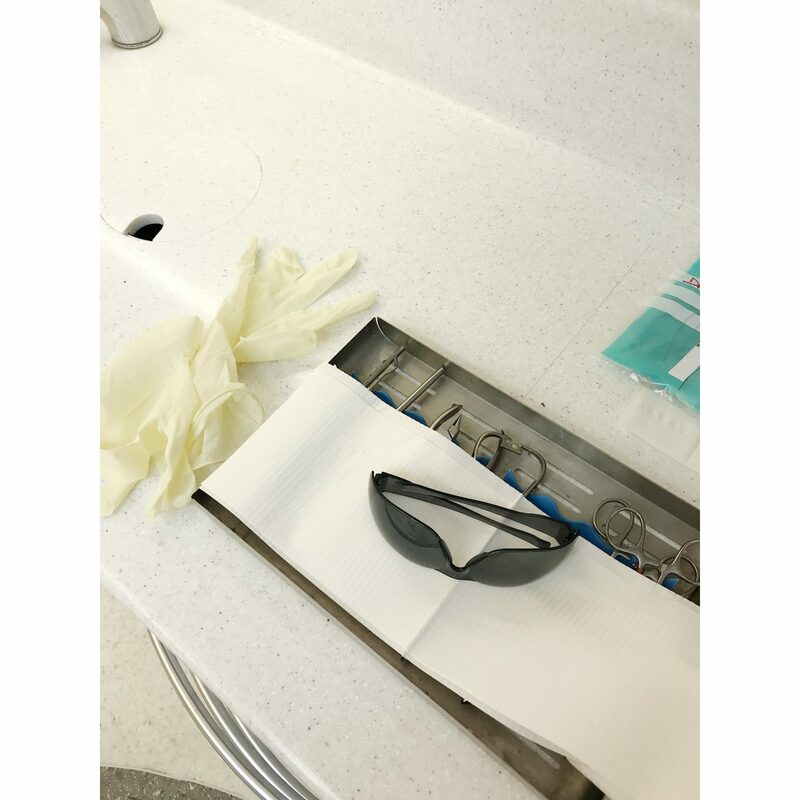 That being said it ruled out the Invisagln for me – the clear retainer you can take out. I know that’s a great option for others, but with me it just wouldn’t work with me or my lifestyle as they have to be worn 22 hours a day. You can only drink water in them, so if I had a breakfast meeting, followed by lunch, followed by a shoot, that’s already 6 hours or so gone and unworn. So the less you wear it, the longer the treatment will take. That than left me with the options of the traditional train-tracks, which are actually more expensive than Invisalign in most places. But they align your bite, and are in most case a lot quicker at straightening the teeth. I know I cant take them out but I need to not have that option. This way I’ll just have to get use to them from the start. After a long look at the pros and cons, I decided to go for the lingual braces which are behind the teeth. Just with my job I couldn’t risk having them and not being confident in my photos. I know there’s the traditional braces which are white so super discreet, but I love red wine/tea/curry and I’ve heard they stain a lot, plus I just thought that since I was paying so much for them anyways, I may as well pay a little more and get the ones I want. Yes I have found other places which offer these treatments at a much lighter price, but like I said it’s the people you pay for. I’m 100% sure that I’m in safe hands with Dr Asif Chatoo, him and the staff are great. Plus it’s your teeth, and if theres one thing you should never try save money on it’s them. Today I had them fitted! Yes I went through with it! It’s been 4 hours now and I feel fine (I mean I know tomorrow is going to be the real killer but whatever). The procedure took around two hours, with the brackets being glued in sections. It was all pretty painless, just slightly uncomfortable with the mouth guard, tongue guard, million tools going in and out. But that being said it all happened so quickly, I even managed to than run home and eat some pasta before the pain starts. I left the clinic totally prepared and happy with what’s to expect, also I have Dr Asif Chatoo’s number placed on speed dial incase there’s any emergencies along the way! Fingers crossed it all goes well, just a full on lisp to get my head round now. And will be heading back in 4 weeks for a quick check up and wire tightening. Keep watching my insta-stories for regular updates!